There’s been a big advancement in the development of mobility aids. Gone are the days when the options people had were limited to crutches and traditional walkers. Today, we have things like stair lifts, transfer benches, and even knee scooters. Just in case you didn’t know, knee scooters are also called knee walkers or broken leg scooters. If you hear either of them, they basically mean the same thing. What is the best knee scooter available right now? Well, this is exactly why we have prepared this comprehensive guide, to tell you the top ones available at the moment, explaining their pros and cons, and who they best suit. After reading this review, you should be able to easily decide which one is ideal for you easily. Without much ado, let’s start by listing our top 4, we will go into each one in detail thereafter. Now that we have listed our top 4, let’s go on to some specific details about each knee walker. This is by far the best medical knee scooter available right now for many reasons. It is very well built, with large tires that can handle both indoor and outdoor use. It is versatile and comfortable to use. It has a very modern appearance with a sturdy metal frame that can cope with weights as high as 350 pounds. Its seat and handlebars are adjustable in height, so you can easily use this scooter if you’re between 5′ and 6’5″ tall (most scooters have a lower weight and height capacity). In addition, you can easily fold the handlebar and remove the seat when you need to store or transport this device. It is very easy to steer around, it comes with an advanced mechanism that helps you have better control of the scooter. Its brakes are also lockable, so you can stay steady in one place if you want to rest a bit. Its large 12-inch pneumatic tires help you prevent an unnecessary wobble and discomfort when riding through different terrain. It makes it perfect for both outdoor and indoor use. You can ride through malls, beach sand, walkways, and even beach sand. This is one feature that makes it easily stand out when compared to other products in its category. The knee platform is soft and contoured to fit the anatomy of your leg, the scooter also comes with a detachable basket that you can keep your personal belongings when going for a ride. One thing that some people may consider as a downside is its cost. It isn’t the cheapest knee scooter but certainly provides a good value for your money. Many customers were really pleased with its off-road capabilities, it certainly was usable in different terrains. This scooter is rated well, meaning that a great number of people who purchased it were satisfied with its performance and comfort. One thing to note though is that you’ll need to be careful when going around corners, it could tip a little bit. As its name implies, it is for people who are on the go. It is very compact, portable and folds very easily. There’s no bulky frame or cumbersome maneuvers, this is one very awesome, pretty, well designed, and sturdy device to help you move around easily. 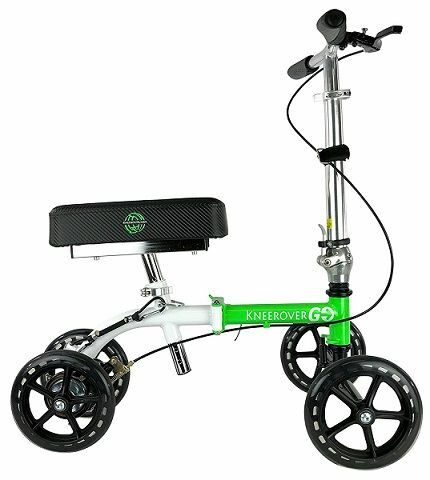 This is perhaps the most beautiful broken leg scooter available right now, its cute petite size and unique color are very attractive to the eyes. If you’re one who cares a little more about style, you should consider getting this. Apart from its beauty, it is well built, its frame can handle weights as high as 300 pounds. The seat and handlebars are adjustable to fit people whose heights are between 4′ and 6’2″, also these can be easily folded to give the scooter a very compact shape that can be transported in your car trunk or taken on a bus or train. It seems to be perfect for indoor use. This small scooter can have you riding around without much hassle with easy steering. 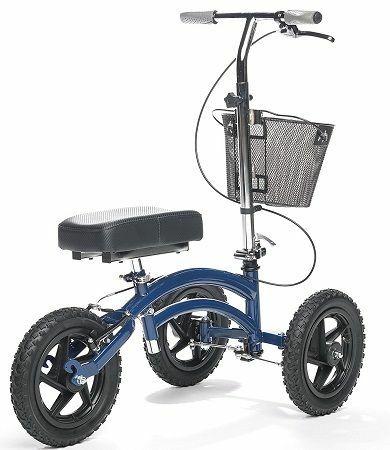 It has four 7.5 inch wheels that help to support your weight when you move around. Its brakes are also very good, giving you sufficient control when riding. Riding on this scooter can be very comfortable. You will feel well balanced and can steer around easily. Care must be taken though because it doesn’t seem to do well on uneven surfaces. It has a thick pad to cushion your knee, however, if you need to use it for extended periods, you may need to supplement this cushion by buying an extra pad. There are a few things that can be improved on in this bike. Its kneepad can be a little uncomfortable if you use it for long periods. Also, it does not come with any basket to carry your personal items. If you are very tall, you should consider getting another scooter because this would be quite small for you. Its height limit is 6’2″. There was an overwhelmingly positive review of this product. Customers were very excited by its aesthetics and portability, many people were able to fold it into a very compact shape in a remarkably short time. Its steering was easy, able to go through corners without any problems. On the other hand, there were complaints about its size for people who were very tall. This is best if you’re looking for something very light and easy to use. At just 20 pounds, it is significantly lighter and easier to use than most other scooters. Some people just don’t prefer a bulky mobility device, hence preferring this. It has a very strong frame that can handle weights of up to 300 pounds without breaking down. You should expect to be able to use this scooter for a long time if your rehabilitation period is lengthy, it won’t easily get degraded with extended use. 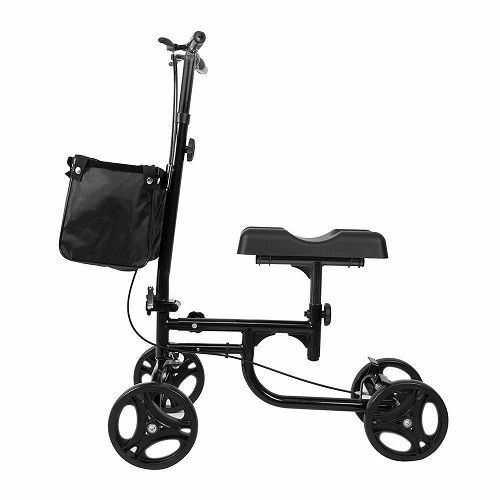 It has four PVC wheels that help to hold your weight and provide some stability as you move around. You can also fold the product when you need to get on a bus or train. It has perhaps one of the best brake systems among products in its category, it can be used very easily both indoors and outdoors without any problems. Due to its fair turning radius, you should not be bothered about slipping off or tipping when navigating a corner. Unlike many other products, the seat of this scooter is very thick and comfortable. The seat is very uniquely designed, contoured with four ridges to keep your knee from falling off when you move around. Also, the PVC wheels help to provide some comfort when you are on uneven surfaces, you may not feel the impact as much as you will feel with other products. It comes with a basket for you to place your items like phones and wallet. Even at the lowest level, it could be a little too high for people who are not up to 5’4″. Also, it could be quite a bumpy device to ride when you have to use it outdoors on uneven surfaces. Most of the reviews were positive, with most people very impressed by how convenient it is to use. There were a few complaints about it being a little bit too high for them to use. 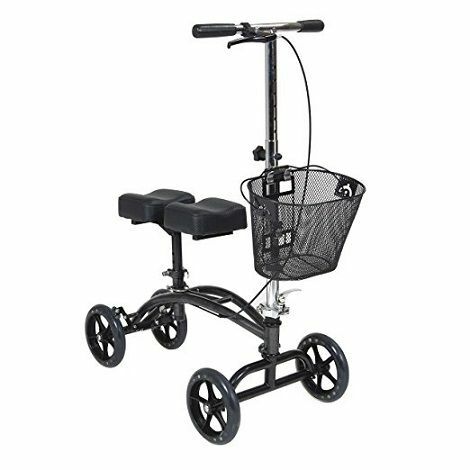 If your doctor suggested that you should avoid bearing weight on your legs for a prolonged period and you need a very comfortable scooter that can help you with easy ambulation, you should get this. It is also very affordable. It is a solid product that can support weights as high as 350 pounds without any issues. As a matter of fact, it is so durable that the manufacturers attached a limited lifetime warranty on it. It has four wheels that help to distribute your weight so you won’t tip over when navigating corners. It is also relatively foldable, you can bend its handlebar when you need to store or transport it. It can be easily steered around your home or even outside on walkways. It has a very good brake system and locks, just in case you need to rest or get seated on it. This is a scooter that can actually serve you for a long time if you have a lengthy recovery period. While most other products come with one semi-comfortable kneepad, this device comes with two. The significance of this is that you can ride around in comfort. In addition, it comes with a basket to carry around your personal items like phones and wallets. The seat and handlebar are adjustable, so you should be able to get a good, comfortable height for yourself. The split seat design could be a disadvantage as it makes the seat a bit too short for some people. Very positive reviews based on how beneficial it was in helping with mobility, especially for those who just had one surgery or another. Also, the cost of buying the item seemed to match the cost of renting it for some weeks. On the other hand, some people didn’t like the unique seat design, some reported that their knees easily got in between the two pads, directly touching the metal. Should I Buy A Knee Scooter Or Rent One? People often have to make a choice between purchasing and renting one. Choosing to rent a scooter may seem to be more attractive for people who need one temporarily, perhaps for a few weeks. But the thing is that the cost of renting is often similar to what it will cost to actually purchase a good one. So we think getting yours may be better. Also, the predicted recovery time may not always be correct, so you may be under some pressure to rush your recovery process to beat the deadline you set to return the scooter. So, we have reached the end of this guide, and we hope you have been able to get all the details you need before making your decision about which one is best for you. We’ll also love to hear from you. Is there any product here you’ve used or currently using? We’ll love to know your thoughts, leave a comment beneath this post. Also, if there’s any other scooter you think should be on this list, please let us know, we look forward to updating this guide regularly.